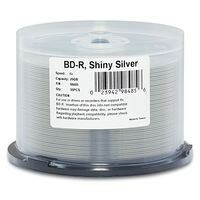 High quality 6X 25GB Blu-ray discs by Verbatim, shiny silver for thermal and silkscreen printing. Quality trays fit well in my other cases. Arrived fast and the delivery guy even came to my house for a second time to drop off the package and make sure I got it because I missed him the first time.